Roses are the very devil for fungal diseases AND here on the Coffs Coast we have the most ideal conditions for them to proliferate. 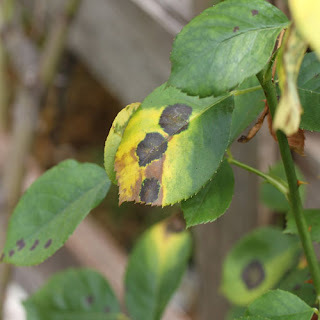 This disease is caused by the fungus Diplocarpon rosae, and is the most prevalent disease problem facing rose growers throughout the world. The spores must be wet for at least 7 hours before they can germinate and a temperature of 18℃ is best for spore germination. The disease develops most rapidly at about 24℃ but temperatures of 30℃ and above inhibit its spread (although some research suggests that temperature above 36℃). Black spot causes defoliation that occurs when the fungus is allowed to spread uncontrollably and since the main function of foliage is to photosynthesise, creating nutrition for the plant for further growth, there will be weaker growth and reduced bloom in the season following severe black spot damage. This is caused by the fungus Podosphaera pannosa, and is one of the most common foliar diseases of roses. The conspicuous white growth can affect all aerial parts of the plant, but mainly new soft growth. High relative humidity is favourable for infection but unlike many other fungal diseases, extended periods of leaf wetness are not required in order for the spores to germinate, which means that powdery mildew is often a problem during dry summers. Temperatures between 16-27℃ make conditions favourable for its development and spread. 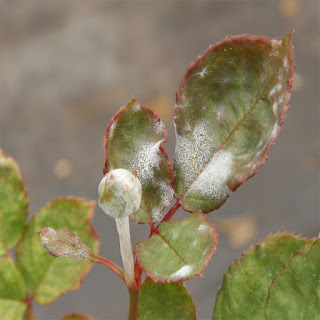 This is caused by the parasitic fungus Peronospora sparsa and only attacks roses in ideal conditions. These are when there is constant high humidity (＞ 85%), low night temperatures and moisture on the leaves. The optimal temperature for spore germination is between 10℃ and 18℃. No germination will take place at temperatures ＜ 5℃ and the spores are killed at temperatures ＞ 27℃. Symptoms occur on leaves, stems, peduncles, calyxes and petals. The purplish red to dark brown irregular spots or blotches on leaves might be mistaken for spray burns or black spot. 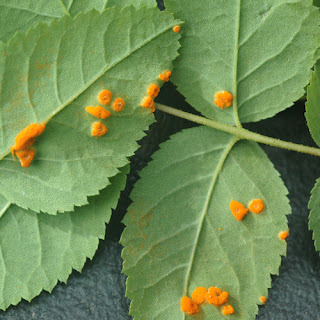 Rust is caused by the parasitic fungus Phragmidium tuberculatum and some other closely related species and is considered the least serious of the common rose diseases. It appears as raised red-orange spots on the undersides of leaves and yellow blotches on the top surfaces. Rust thrives in cool, moist weather (18-21℃), especially in rainy, foggy or misty conditions. This disease will develop on leaf surfaces that remain wet for 4 hours (as can occur during summer). Plant roses in full sun - they should receive a full six to eight hours of sun daily. Plant roses in an area with good air circulation and space them well apart. Prune roses to remove dense growth from the heart of the bush (try to achieve a vase shape). Water correctly - avoid over-head irrigation during the late afternoon/evening. Choose resistant varieties - do some research and seek expert advice when choosing rose varieties for your area, generally speaking Rosa rugosa varieties are generally fairly resistant. Assiduous spray program every three weeks during the growing season and use a variety of sprays. Pick off and destroy infected leaves in spring to slow disease progression. Collect and destroy fallen leaves to prevent black spot overwintering. Apply a thick mulch of organic material. There is some excellent advice to be found at the Treloar Roses website about rose care and problems with them.